Banff is undoubtedly, a winter wonderland; The snow covered mountains, the ice rink by the high school, the ski hills, the winter sports stores. In the Prairies, people leave. They are called snowbirds, our migrating population, mostly retired, who head south to Arizona, Nevada, Texas and California for the winter. The snow came early though, not many have left yet, but they are hurrying to get their affairs in order. For those who must remain, this early snow predicts a long, cold winter. The newspapers have tracked road traffic collisions since the snow began on Thursday. Traffic news on the radio lasts three times as long, and the general point is, “it’s snowing, please drive slowly and carefully”. Unlike in Ireland, there is no talk of only driving if it is “essential”. The radio does not announce school closures. The buses may not run, but the school remains open. Heads shake, frowns grow, nerves tighten and ladies refer to the “other, nasty 4 letter word”. Unlike last year, when I sauntered to work with flakes falling gently on my face, crunching in my snow boots through 2 feet of white fresh snow, I must drive. The roads are in good condition- I always check with the AMA website before leaving. I see white, however, and I naturally slow. I want a bumper sticker for my car to inform motorists, “we don’t get snow like this in Ireland”. The wonder is the car parks. Somehow, cars are parked, in line, in order, even though we cannot see the grid lines. There are 2 rows of parked trucks and cars where there is meant to be 2, nobody has parked awkwardly, unsure of where the box actually begins and ends. I simply aligned mine with the ones around me, and chalked it up to the Canadian sense of order. I miss the Irish sense of wanton abandon; remember 2 Christmases ago? Drivers were so delighted to have made it through ungritted roads to Letterkenny, that when they got to the car park, they simply stopped in a spot to let go of the steering wheel and relax those twisted nerves. You knew the world was out of sync; the car parks lost all sense of organisation. There was an eerie sense of quiet upon the town, without the usual hustle and bustle of weekend shoppers, let alone the festive madness there should have been for that time of the year. Not here, no. Lethbridge is as busy as any Saturday, just with mittens and boots and pick-up trucks with boxes full of snow. Stores have footprints of water throughout the aisles, and that’s ok. The snow began 2 weeks ago, and Fountain Tire (yes, I know, I’d have spelt it TYRE too) were inundated, putting on the winter tyres. Somehow I was prepared: My father will be delighted, and surprised. I’d needed new tyres so it made sense to make them the winter kind. Are they working? Well, I am not sure if it is the tyres, the lack of any alternate choice or the general confidence of drivers that surround me, but you just get on the road and keep it between the ditches, preferably, the white line and the yellow line. The centre line is yellow here, not white. I often wondered why and I think the snow answered it- a yellow line is more visible in the snow. The white line making the side of the road, doesn’t matter as much in this weather. I go a little slower (sorry, drivers behind- see bumper sticker) when a semi (a big, big lorry) or the snow plough is coming towards me. They shoot snow on my windshield and I am temporarily blind. I am grateful that I can get to work, or go to the city, but I think longingly on that December in Ireland. Everything stopped. Children waited for Highland Radio to name their school in the list of closures. I watched out my window at the snow fall, something rare and marvellous. I put on a fire and cuddled in. It is beautiful here. Walking to the gym, from the gym, home from work late at night, sitting looking out my bedroom window, it is all around me. It is too overwhelming to take for granted. The mountains are snow-covered but each differs from the other. As I run on the treadmill, I looked out, up to Sulphur Mountain, its evergreen trees rising above the white blanket covering the mountain. In the distance, mountains I cannot name stand white and grey. In my bedroom, I look out at our 2 snowmen. They were built after my first day of skiing with 3 friends, new friends, good friends. With each new snowfall, they get a new coat of white. The deer has taken their noses and we have learnt not to do that again. One is headless, the result of human wildlife straying through our lawn. When we get more snow, I will put a head back on him. Across the street, a red water column stands amidst the white snow. Now and again, snow falls. Sometimes, heavy and thick and sometimes, just a light dusting. I imagine this will continue throughout winter, but who knows, Banff is full of surprises, like this morning, the 2 big beautiful, brown horses pulling a trailer down my street and I wished I had my nieces and nephews to see, because I think only they would have been as excited as I. It sometimes feels to cold to breathe, and I breathe through or onto my jacket or scarf. Temperatures take on a new meaning. -2 is quite fine. -20 means a little more time to wrap up. At the Banff Centre, I walk down the stone steps and there stands on the green at least 2 reindeer, or elk, or deer, I am not quite sure, but the general shape at this time of year suggests reindeer, and they are wrapped in fairy lights. The path is cleared of snow and I appreciate those who take the time to de-snow and de-ice the paths all around town. I appreciate even more those who do it with a smile and a nod and those who stop to talk to me while I do ours. When I arrived here it was beautiful, a summer sun shining down with rich greens and tall trees and a blue sky. Tourists thronged and hiked and climbed and shopped. It is quieter now; Banff may be a ski capital but summertime is the busiest season of all. 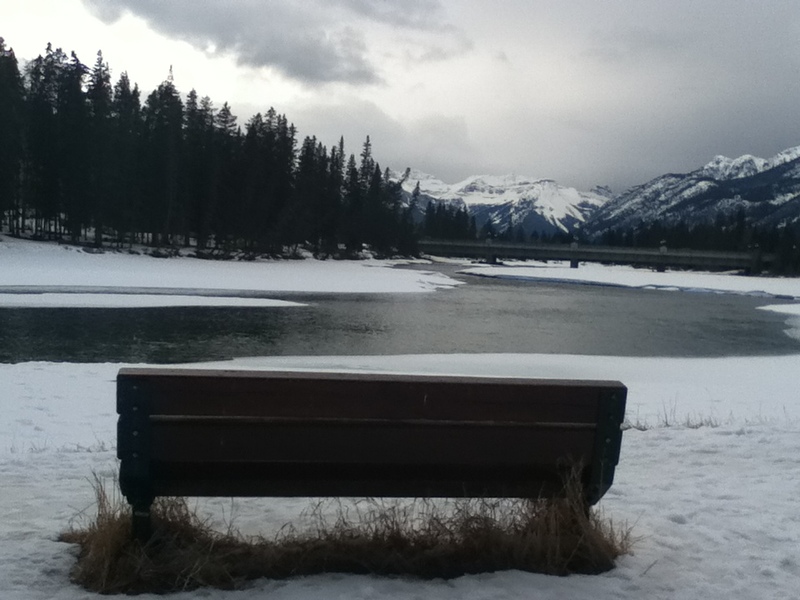 I lay in the Park and read, and ran along the river, walked up Tunnel Mountain and sat by the river. The lying outside has long ended. The trails are now to icy to run on. I sometimes sit by the river even now, wrapped up, watching it freeze from the outside in. In some places, it has already frozen over but at my spot the water still flows. There are people I know now; the lady at yoga who goes to my church, my yoga instructor in my favourite cafe, my coffee server, people I once worked with who have now moved to a different job. It feels more like community. There is a kindness here. This is a place of holidays and leisure and those who live here protect and guard their Park. People smile and take time. They sit and enjoy. They ski and snowboard and walk and hike and skate. They mix and help. I am glad I saw it through from summer.